In the oil-rich enclave of Cabinda, in the northernmost part of Angola, three individuals share a prison cell, since March 14, charged with crimes against the state security and sedition, for a protest against bad governance and human rights abuses, which never took place. Their arrests and the charges leveled against them, are what illustrate the sophistication of the authoritarian rule in Angola. Members of the state security arrested Marcos Mavungo, a university lecturer and oil worker for Chevron, as soon as he exited the Catholic Church where he attended morning mass at 7h00. He was, in fact, the lead proponent of the protest. The local government swiftly prohibited holding the protest the moment it was notified by the organizers several days before. The demonstration was supposed to be held in the afternoon but the ban, and the massive deployment of police officers in the small urban district of Cabinda City, meant people would not dare to assemble. In the same morning, Arão Bula Tempo, a lawyer and the local head of the Angolan Bar Association, had accompanied his client, businessman Manuel Biongo, to the border checkpoint of Massabi. Mr Biongo, driving his car, had gone there to close a deal with his Congolese partner who lived across the border in Point Noire, Republic of Congo. As they waited for the checkpoint to open, at around 7.20, a police officer “invited” Mr Tempo for a meeting in his office. There, he was told that he had to return immediately to the nearest municipality of Lândana, for a meeting with the representatives of the Intelligence Bureau of the President of the Republic and the Provincial Commander of the Police. In Lândana, both learnt of their arrest when hauled into a police car to take them back to the city. At the Provincial Directorate of Criminal Investigation, the detainees were only informed that they were under police “custody”. After three days of detention, the police informed Mr. Tempo and Mr Biongo that they were suspected of having driven to the border to pick up foreign journalists to cover the “anti-government” protest. Both were charged with conspiracy with foreigners to undermine the state security, under the State Security Law. On March 19, Mr Mavungo stood summary trial at the Cabinda Provincial Court, accused of the crime of sedition , “for attempting to act against the state security”. According to his lawyer, Luís Nascimento, the public prosecution alleged in court that his client had been caught in the act of committing such a crime. 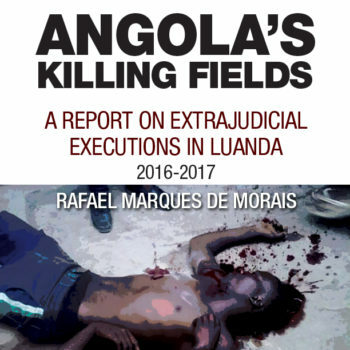 The public prosecutor André Gomes Manuel “also acknowledged that he had not consulted the case file and that the accusation was fraught with unfilled gaps”, the lawyer told Maka Angola. Thus, the public prosecution requested the trial to be adjourned to allow the gathering of evidence. In turn, the defense lawyer argued that the judge should dismiss the case without prejudice for lack of evidence against the Mr Mavungo. Judge Jeremias Sofera José concluded that the accusation lacked evidence, and that the state security agents, who arrested the defendant, did not appear in court to testify. Therefore, he ruled for the public prosecution to take the case back to find proper evidence, and remanded the defendant into custody. On March 26, Mr Nascimento petitioned the Attorney General of the Republic, general João Maria Moreira de Sousa, on behalf of his client. He requested bail for Mr Mavungo on the grounds that his client’s constitutional rights of presumption of innocence had been violated. The attorney general has yet to respond to the petition. Maka Angola contacted his office, and it was informed that no such petition has been recorded in the correspondence received. Lawyer Luís Nascimento provided a signed copy by a clerk from the attorney general’s, confirming that the petition had been officially submitted. Mr Tempo and Mr Biongo were both charged with conspiring with foreigners “to constrain the Angolan state”, under the Law on Crimes against the State Security. The evidence against them stands on the alleged grounds that they went to the border to pick up foreign journalists to cover the anti-regime protests. As the charges were filed, the Angolan Bar Association submitted an appeal for a habeas corpus on behalf of his representative in Cabinda, Mr Tempo. It argued that his detention was and remains illegal. Lawyer Luís Nascimento believes that the Supreme Court might take more than three months to decide on the habeas corpus, “unless there is a little push”. The suspects are, indeed, a danger to the “security” of the regime as far as human rights issues and the narrative on the oil riches are concerned. Cabinda has always harbored a secessionist movement, which became interwoven into its social fabric. Thus, both local activists and the government have preyed on it for opposite ends. For the local activists the sentiment, in favor of a Cabinda that is either independent or autonomous from Angola, provides a fertile ground for mass mobilization. Although the enclave produces up to a third of Angola’s oil, the local population of some 300,000, do not partake in the dividends of the riches it produces. For the government the longstanding anti-Angolan sentiment in Cabinda provides an excuse to act aggressively to squash any dissent. Any legitimate or constitutional concern not favorable to the authorities is easily labeled as an activity against the state security. In 2010, the government successfully used the gunmen attack on the Togo national football team, as it drove to Cabinda for the African Cup of Nations, to finally deal a blow to the pesky local and organized civil society. Some of Cabinda’s more articulate and vocal leaders were arrested along with a number of other civil society activists, and spent up to a year in prison. One was a Catholic priest and former vicar of Cabinda’s Diocese, Raúl Tati, and the other was a lawyer and human rights defender, Francisco Luemba. Their arrests signaled the disbanding of what was the core group of intellectuals who could articulate ideas and mobilize the masses. The perpetrators of the attack on the Togelese team were never brought to justice, but the civil society leaders paid the price. Five years later, Marcos Mavungo, known for his radical views on Cabinda, remained one of the few people in Cabinda who kept a respected log on ongoing human rights abuses. His attempt at organizing a protest, meant he had “violated” his low profile of the past few years, and was daring to make a comeback. Meanwhile, Arão Bula Tempo, is the paladin and the most senior of a handful of human rights defenders in Cabinda. His position, since 2012, as the representative of the Angolan Bar Association became thorny for the regime and for the bar itself, as he has used it to advance the promotion of human rights. As a lawyer, Mr Tempo has not shied away from defending highly sensitive political cases promptly tossed by his colleagues. The violent expelling of Congolese nationals, forced mass evictions, and the staple cases of people detained for “crimes against the state security” are among the causes he has fearlessly defended. Since 2010, he has become the one authoritative public voice on human rights issues in the enclave. Mr Tempo has forfeited his personal wellbeing to be at the service of the poor, who flock to his shabby office seeking legal representation. This is his main appeal to the general public and what has led the authorities to single him out. He has repeatedly suffered intimidation and death threats by the security forces. He cannot be allowed to be a man of the people. It is too dangerous. According to his persecutors, Arão Bula Tempo had arranged for some Congolese journalists to go to Cabinda to cover the protest. Assuming that to be the case, how does it constitute a crime against sate security? Are the freedoms of the press and of expression a crime? Another rumor against Arão Bula Tempo was that he was preparing to publish a human rights report. Again, how does that amount to a crime against the state security? In jail, Mr Tempo and Mr Mavungo, who have been at odds on how to prop up civil society in Cabinda, now have time to set aside their differences, and forge common ground. But then Mr Biongo is with them, and he can be either on their side or a spoiler. There is no sophistication in the regime’s strategies and actions to weaken, and prevent knowledgeable individuals from representing the concerns of the downtrodden. If there is sophistication, it is in the national propaganda and international PR to project a different image from reality.